As seen in the most recent U.S. presidential election, knowing your audience and having the right messaging means everything when it comes to getting the results you want. While it might not seem like something within the Brafton wheelhouse, we do in fact have experience in the political sphere. As a matter of fact, our founders actually have roots in political campaigning over in the U.K. This is the story of how our expert Promotions and Engagement team worked tirelessly for one of our clients to get help get them elected to local office. And the best part is, the approach that they took can easily be applied to any business to increase brand recognition and engagement among a target audience. Our client came to our team in need of some assistance building up their personal brand. Their goal was to be elected to fill one of three seats on a local board. Competition was stiff but they knew the experts at Brafton had the know-how and the gumption to help them achieve their goal. It was apparent early on that a paid social media strategy was going to be a key component in winning this election. Knowing that this zero-sum situation was heavily reliant on voter turnout, Brafton’s team of strategists crafted a marketing plan that would afford our client with the most exposure possible by keeping spend per advertisement at a minimum. Working closely with our client, we created hyper-targeted ads on social media using a variety of different asset types to engage with and educate voters on key issues. As with most local elections, our client participated in a number of town hall meetings where they were able to demonstrate their expertise on the issues. These meetings were recorded and made available for public use. Knowing that all potential voters were not in attendance at these meetings, our team set out to expose as many voters as possible to the compelling information that was presented during these gatherings. One example of the results of having a targeted video advertising social media strategy. 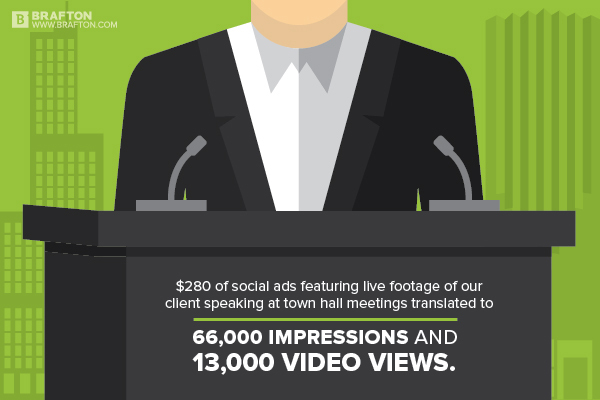 We took footage of our client speaking at these meetings and cut it into bite-sized snippets that were then used in the aforementioned targeted social media ads. This resulted in an outstanding 66,000 impressions and 13,000 video views for just $280. The approach of leveraging video advertisements is largely what enabled us to expose this information to such a wide audience and ultimately (spoiler alert) get our client elected. As you might know, the success of a Facebook ad is largely reliant on the ad relevance score it receives. The top two suggestions that Facebook offers for optimizing ads for relevance are to be specific with your audience and to use images or videos. By knowing exactly who we were targeting, and doing so with content that directly addressed their concerns, we were able to game the Facebook ad system in our favor to keep our client’s costs down and their exposure up. Our team knew better than to put all of our client’s eggs in one basket, however. To reach as many voters as possible, our sharp-minded strategists supported our advertising efforts with engagement on both Facebook and Twitter, two of the most active networks for the demographic we were targeting. We worked closely with our client so we knew where they stood on the pressing issues that were important to their voters. Armed with that knowledge, we set out to speak on behalf of our client, disseminate their goals for what they hoped to achieve if elected and field any questions that arose along the way. The last component to our engagement efforts was a bi-weekly newsletter that addressed any recent news that was pertinent to the voter base. This was our opportunity to provide more formal outreach and direct the conversation to topics that we wanted to address. In the past, we’ve provided you with advice on how to fine-tune your audience targeting to get more out of your Facebook ads. While having a curated group users to target is still as important as ever, there’s more that goes into Facebook’s relevance score. According to Facebook, your ad relevance score is calculated based on the percentage of your target audience that performed the desired action associated with the ad (clicking to your site, liking your page, watching your video, etc.). Facebook uses the first 500+ times that the ad is served to your audience to perform this calculation. So, for example, if you create an ad that is highly targeted and aimed to get people to click to your site, it might receive a low relevancy score if the ad itself does not entice the audience to click. This is why you need to make sure you’re leveraging content types that are highly engaging with messaging that matters to the audience you want to target. Facebook suggests using custom images or video to garner engagement, and we tend to agree based off of the work that we’ve done for this campaign and for many of our other clients. To put it simply, if you want to get the most out of your ads, you need to think long and hard about what messaging is going to strike the right chord with your audience. Analyzing your social media data is a great place to start in this endeavor, but never lose touch with your brand voice and creativity in the process.